Tweeting Lawyers: Follower Insights & Best Times to Tweet – Web Presence Esq. What does this mean for a lawyer looking to create an effective social media marketing campaign? Business development is about to get a whole lot more targeted. Using Twitter’s audience insights (access yours here), a savvy lawyer can take this valuable information all the way to the bank. There is no one size fits all approach to marketing for lawyers and law firms. Even firms with similar practice areas have unique niches and qualifications. By analyzing audience insights on Twitter, you can share what sets you apart from your ‘competition’ with your potential client pool with a highly targeted, strategic approach. What are you hoping to gain by maintaining an active Twitter handle? Your ideal tweet time will depend on your objective (link clinks or user engagement). If clicks are your goal, tweet links (such as links to your blog posts) between 2 a.m. and 3 a.m. 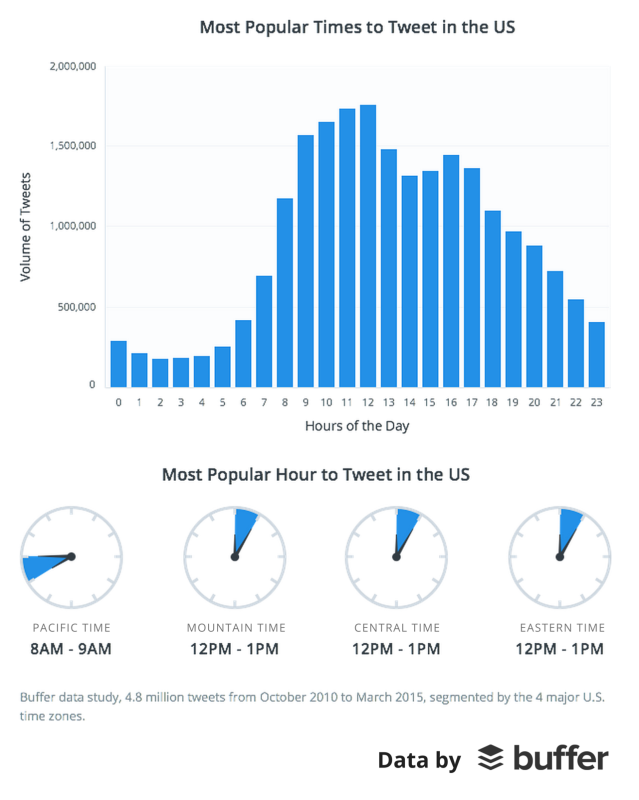 The fewest clicks per tweet take place between 9 a.m. and 1 p.m. If you’re in the mood to engage (Buffer defines engagement as clicks, retweets, favorites and replies), try between 1 p.m. and 5 a.m., with engagement peaking between 2 a.m. and 3 a.m. When used properly, Twitter can be an incredible powerful tool for business development. Learn more about the importance of having a smart, ethical social media marketing campaign here or contact one of our knowledgeable legal marketing professionals.